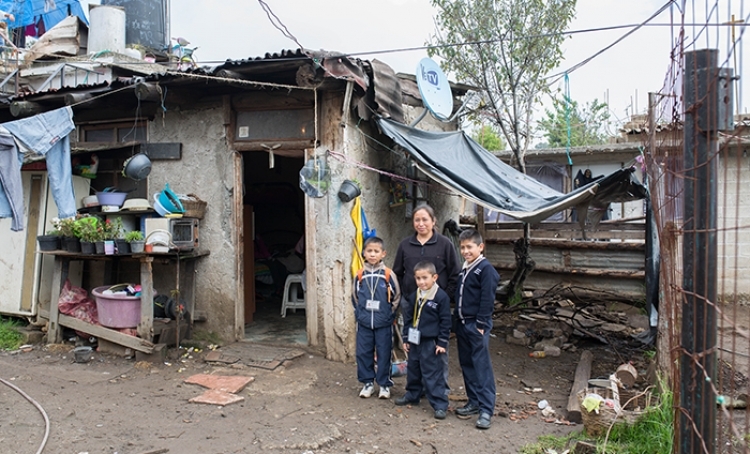 Luis (10), Gerardo (8) and Sergio (6) live with their mother and five other siblings in a one room house. The home has an aluminum roof, dried mud walls and floor, bootlegged electricity and no running water. The home is just big enough to fit two sets of bunk beds. Several local families share one outhouse. The boys’ oldest brother works at a nearby stable cleaning horse stalls to support the family of nine. The three brothers attend Christel House Mexico. They wake up at 5:00 am each morning and use water from a community tap to shower and brush their teeth. The boys’ home is far from the school, but the trip is worth it for them. If the boys weren’t at Christel House, they would attend a local school that only runs for 2–4 hours a day. Sometimes that school goes months without a teacher. “I notice the difference between what we learn at Christel House and what my friends learn at public school,” Luis says. “They don’t get food or uniforms. There is no nurse. They don’t have computers or learn English, art or music.” Even at a young age, the boys know their lives are different because of Christel House. The boys’ mother often rides with them to Christel House. She volunteers and attends workshops for parents. “Christel House teaches me things I had no idea were important,” she says. The boys love many things about Christel House, but “food” was at the top of each of their lists. They arrive to school hungry many days. Dinner at home often consists of broth and, on special occasions, their brother brings home a loaf of bread. They are very grateful for the breakfast, lunch and snacks they get at school every day. Luis, Gerardo and Sergio are evidence of the power of your investment. Continue the impact.